The European Space Agency's Rosetta spacecraft is studying the Comet 67P/Churyumov-Gerasimenko at close range. On Nov. 12, 2014, Rosetta's small Philae probe landed on the surface of the comet in a historic space first. SEATTLE — The European lander currently hibernating on a comet did not successfully sample the icy body using a drill after the probe made its historic comet landing in November. The Philae lander's drill did not deliver any samples of the comet to instruments on the lander after the probe touched down on the surface of Comet 67P/Churyumov-Gerasimenko on Nov. 12, Paul Weissman, a Rosetta program scientist at NASA's Jet Propulsion Laboratory in California, said. Scientists deployed the Philae's lander's drill — designed to deliver sub-surface samples to various instruments on the probe — after it bounced twice, eventually landing in a shadowy part of the comet. "It [the drill] didn't deliver any sample," Weissman told Space.com after his talk here at the 225th meeting of the American Astronomical Society yesterday (Jan. 5). "That's all I know. We do have measurements from those instruments and all they're measuring is what we see in the atmosphere. They're not measuring any solids." All hope is not lost for Philae and its drill, however. It's possible that ESA officials might be able to re-deploy the drill if the lander wakes up later this year, Weissman added, but it depends on the position of the lander. Scientists hope to use the drill in order to learn more about the composition of the comet itself. At the moment, the Philae comet lander isn't getting enough sunlight on its solar panels to continue operations, but the environment might become more favorable as the comet gets closer to the sun this year. The lander stayed functioning for about 56 hours on the surface of Comet 67P/C-G before beginning its hibernation. Officials still aren't exactly sure where Philae is located. Scientists have been using images taken by the Rosetta orbiter — currently circling Comet 67P/C-G — to try to track down where Philae ended up after its bouncy landing. Photos taken by Philae itself after landing show a structure resembling a cliff on one side of the probe, leaving the lander in a shadow. Rosetta is still in good shape and beaming back science from orbit around the comet. 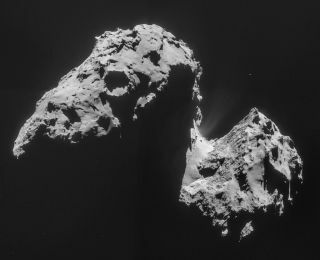 Scientists have already made measurements of the water composition of the comet, and Rosetta has taken some amazing photos of the oddly shaped cosmic body. Philae and Rosetta launched to space in 2004 and arrived at Comet 67P/C-G in 2014. Rosetta is expected to continuing studying the comet as it makes its closest approach to the sun in August. The mission is currently scheduled to last through the end of 2015.